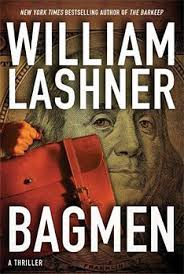 Michael D. Schaffer, my editor at the Philadelphia Inquirer, offers a good review of William Lashner's Bagmen. If they gave a Pulitzer Prize for snappy dialogue, William Lashner would be a betting favorite every time. Dialogue is a big part of what makes crime fiction go. "Show, don't tell" is OK advice, but the giants of the genre - Elmore Leonard, Raymond Chandler, Ross McDonald, Dashiell Hammett - knew conversation counts. Let the characters tell the tale. Politics, stripped of its masquerade of policy, is an exercise in pure personal ambition. Right up my stinking alley, you would think. But the shoes gave me pause. "You've got to be kidding me," I said. "I never kid, Victor, about $500 shoes." "Five hundred? For a pair of slippers? I'd sooner go barefoot." "You might as well, if you intend to wear those . . . those clodhoppers you came in with." "They're my normal work shoes." "What kind of work, Victor, exterminating? Because I've no doubt they're lethal on cockroaches, but they just won't do with a tuxedo. Now this fine pair of Guccis would be just perfect." "They have bows on them, Timothy." "You'll be the belle of the ball." And off we go, to follow Victor on his adventures in the demimonde of Philly's political fixers, the bagmen, the good folks who make sure favors are dispensed to supplicants. Blessed are they who have a friend who has friends in City Hall.